Upon arrival at Delhi airport, our representative shall greet you and help you transfer to hotel by AC Car. Overnight stay at the hotel. In the morning after the breakfast, we shall visit IMF for briefing & equipment check and later drive to Rishikesh via Haridwar. On arrival at Rishikesh we shall check-in at a pre booked hotel. Evening will be kept free to explore the nearby area. Places of interest in Rishikesh include visit to Bharat Mandir, Neelkanth Mahadev and Ashrams, where one can indulge in spiritual studies, meditation, yoga and sacred prayers. After the breakfast today, we shall head to Uttarkashi (1150 mt), which will take 5-6 hrs drive to reach. Upon arrival, we shall check-in at the hotel. Evening will be free to explore the surrounding. At Uttarkashi Nehru Institute of Mountaineering is situated . Uttarkashi is also the gateway to many mountaineering and trekking expedition in Gangotri area. The day is for documentation. After the mandatory formalities are made, we shall explore this beautiful hill town. Overnight stay at hotel. Day 5: Uttarkashi - Gangotri (3048 m/ 10,000 ft) Drive (95 kms). In the morning after the breakfast, we shall drive to reach Gangotri via Harsil (approx 25 km before Gangotri (3048 mt) by covering approx 95 km in 4-5 hrs. On arrival check-into the hotel. Gangotri is known for a beautiful gorge at Bhairon Ghati and as a place where Goddess Ganga descended on earth from heaven. The Temple of Goddess Ganga situated here is amongst the Chota Chardham Yatra destination in Uttarakhand. There are also a large number of ashrams and Dharamshala. The day is for acclimatisation. Overnight stay at hotel. Today, after the breakfast, we shall command further to Bhojwassa via Chirbasa (3600mt). From Gangotri we will trek towards Chirbasa, which is on tree line. From Chirbasa we shall trek further to Bhojwassa, where we will pass through dense forest. Upon arriving at Bhojwassa, we shall camp near a small temple on the riverside. Afternoon will be kept free to explore the area and to enjoy excellent sunset on Bhagirathi group of peaks. Dinner and overnight stay in tents. After breakfast, we will trek to Gomukh (3890mt), which is the origin point of the Ganges. We shall explore the area and then start the trek to Tapovan, which is one of the finest high altitude alpine meadows in the area. The trek from Gomukh to Tapovan is has a steep ascend and as we climb, the view of the surrounding peaks becomes clearer. Tapovan is beautiful meadow that encircles the base camp of the Shivling peak. The meadow is blessed with bubbling streams, wildflowers and ideal prospects of camping sites. 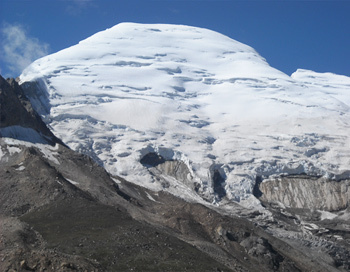 The glacier of Bhagirathi I, II, III (6454mt) provide an impressive backdrop for Tapovan . Dinner and overnight stay in camp. Free to acclimatize and rest, today we shall enjoy the magnificent snow capped peaks, flora & fauna and landscape. Dinner and overnight stay at the camp. After early breakfast we will set out for base camp. Overnight stay in tent. From day 11 – day 18 we will approach to summit the Kedarnath peak. Today after breakfast we will trek down to Chirbasa via Bhojwassa. Overnight in tent. After breakfast trek down to Gangotri and from we shall drive back to Uttarkashi. On arrival, check in to hotel. Overnight stay. Today we shall drive to Rishikesh. Overnight stay at hotel. After the breakfast, we shall drive back to Delhi. On arrival check in to hotel. In the evening, group will enjoy dinner at a restaurant with our Manager. Overnight stay at hotel.